Can an Insect Change the Life I Love? Should it prove true, that grasshoppers and insects prove to be the world’s solution to protein, what would become of cowboys? It’s not like they are going to become extinct. Cowboys are like cockroaches, they adapt, survive, and overcome. A pack of hotdogs, coffee, and a saddle is all that is needed for survival. Some can rub two pennies together and get a hundred dollar bill (Lucas Littles, Doug Reser) and others can do the same and end up with one penny (Me); but the story remains the same, the cowboy way of life isn’t in danger of dying, but think of how this insect thing could change it. 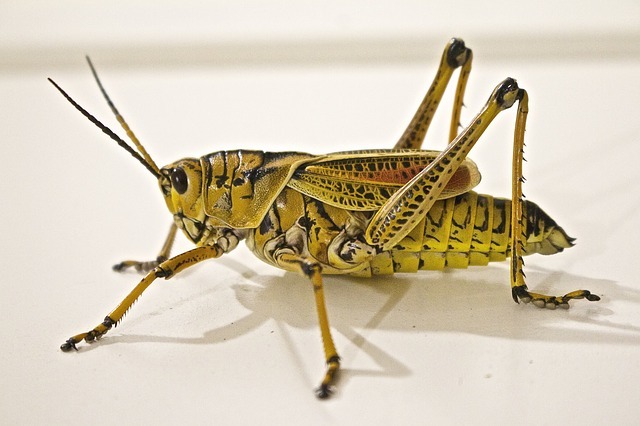 In terms of land use, three acres in Eastern Kansas would feed a cow…but how many grasshoppers. You could pack’em tight. That old saying “make your fence bull strong, horse high, and chicken tight” would have to be changed, but after all it is an old saying and old sayings sometimes need revision. Working stock. The cowboy’s choice of tools has traditionally been a lariat, but like I said earlier, Cowboys are nothing if not flexible. A butterfly net might not look as punchy, harder to attach to a saddle, and not as cool to do tricks with, but it can be just as handy. It’s going to be tougher to look cool and a little more humbling, but I can catch butterflies better than I can rope calves. Winters are hard on cattle herds (and I preface this by saying I’m not an entomologist), it seems like winters would be even harder on a grasshopper ranch. Feed bills would be lower, but all your stock would be dead so there really isn’t any headway. FFA will have to now include insect judging. Instead of looking at cow and determining desirable breeding qualities, there will have to be 14 students huddled around a six legged insect trying to determine if the grasshopper is knock-knee’d. Who wants to listen to that debate. “I felt like locust one had a tendency to paddle with its front end because of its pigeon-toe-ed-ness” or “This locust will never be sound because it’s hind legs are too vertical” would be the standard arguments. See how silly this sounds. Changes may be in store and I don’t know if grasshoppers will replace cattle in the future as the major source of protein to Americans, but I do know this: the second Doug Reser purchases bug zoo’s, I’m goin’ all in!